Growing Up Disney: On the DL with Chad: An Introduction! The best thing about blogging is the people you meet. And one of my favorite new friends is Chad from Days in the Park. Well, I guess it's not exactly a new friendship anymore since we met about a year ago. We are both displaced Alabamians and raging Disney fans. Even though he cheers for the wrong team (War Eagle!) I cannot wait to go to Disneyland and meet this guy in person. Or he has an open invitation for the "Epic Meeting of the Tinks" in 2014 at Walt Disney World. Chad is the driving force behind Days in the Park and if you are going to Disneyland or just like fun photos and stories, be sure to check out his site and podcast. Don't miss the napping shots. You'll just have to go and figure that one out for yourself. 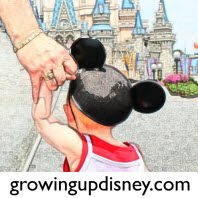 I am thrilled to announce that Chad will be sharing a monthly post here on Growing Up Disney. Check back each month as he schools our Walt Disney World crowd on the "Land" he loves. Hi there! My friend Amy here at "Growing Up Disney" has asked me to swing by once a month (thank you, Amy!) and contribute to her blog, and I thought since she has so many readers who might not be familiar with me that a good place to start might be with an introduction! My name's Chad and I'm a co-creator of the Days in the Park blog, part of a friend and friend combo who enjoy spending many of our days in, you guessed it, The Park; or if you want to get all technical about it, the Disneyland Resort. 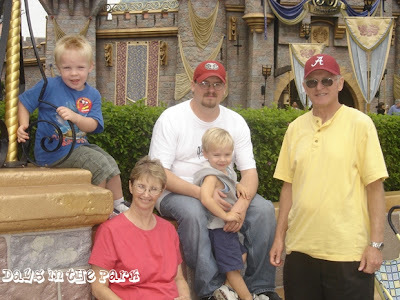 I currently reside in Rancho Cucamonga, California with my wife and three little boys roughly a half hour or so from Disneyland, though I am originally from lower Alabama, which is of course much closer to that other Disney Resort; somewhere in Orlando, if I remember right. Many people over time have asked me where my love of Disney first took hold, and when I look back over the years trying to figure just when and where my love of all things Disney first took root, I think I probably have my parents to thank. Funny thing is, I didn't even set foot inside one of the Disney Parks until I was 17 years old. My earliest memories of Disney are of myself sitting in my living room watching 'Welcome to Pooh Corner' on Disney Channel. I grew up watching anything and everything Disney that I could, and not just the animated classics, but movies like 'The Gnome Mobile', 'The North Avenue Irregulars', and 'The Apple Dumpling Gang' were among my favorites. If the Disney name was attached to it, I watched it. It really was a genuine decision on my parent's part to make sure that I watched decent things on television, and Disney sure seemed to fit that bill. Then when I was 17 my parents, who had saved for years for the vacation, took our family to Walt Disney World for the first (and so far only) time. I'd like to say I fell in love with the place right then and there, but the years have made much of it blurry. However, the feeling I remember having those five days has so far been unparalleled in any other vacation I have ever taken. It made that much of an impression. I then "wandered in the wilderness" for about 14 years, meanwhile getting married and beginning to have children, when on a whim my wife and I decided to take our first trip to Disneyland together, and also on a whim decided to become Annual Passholders. The rest, as they say, is history. I'm still relatively new to Disneyland, and still relatively new to the blogging world, but I would gladly put my passion and heart for it up against anyone else's. I love Disneyland, and I love spending as much time there as I can, and I think that comes through in everything I write. At Days in the Park, we aim to be genuine, and I hope the genuine fun and hilarity we have on our trips to Disneyland shows up in all that we write. And now Amy has given me the opportunity to bring some of that over here to her own blog alongside her family and contributors, and I'm truly honored and humbled by it. Over the coming months I hope I get to know many of her readers here, and that you all get a chance to know me a little bit better and that you like what you see. After all, we all love Disney, and that's why I started, and that's why I'm here in the first place. Many thanks again to Amy for the opportunity to be a part of what she's doing here; "Growing Up Disney" has long been one of my favorite blogs, and to be a part of the contributors here is like a dream come true. See you all next month! Cool! I'll be looking forward to Chad's posts! I just want to say thanks again for the wonderful opportunity Amy - I hope that I do your blog justice as it's one of my very favorites. Looking forward to reading them..Amy you made great choice..
Good for you Chad! Looking forward to seeing your posts here too.